On Saturday 15th February, we received a call from Richard MacKenzie and his crew aboard the "Silver Darling" yacht about a large whale, near South Island in the Forth estuary, which had a rope or netting trailing from the left side of its body. Whilst CRRU rescue coordinator Nick Duthie (also BDMLR Grampian) set off to South Queensferry to liaise with the Forth Coastguard and local port authorities, CRRU director Dr. Kevin Robinson assembled a team of divers and medics to tackle the task of disentangling the leviathan - estimated to measure in the region of 30+ ft in length, and assumed from descriptions to be a humpback whale (Megaptera novaeangliae). When local volunteers Gareth Norman (BDMLR Tayforth group) & Fergus Middleton (Edinburgh division, and SSPCA) arrived first on the scene and managed to locate the animal, however, it soon become evident - to the relief of all involved - that the animal (definitely a humpback!) was no longer entangled and was now moving into the deeper waters of the central Forth channel. In view of this new situation and the now waning light conditions, the dive teams were subsequently stood down, and a collective decision was made to try to relocate the leviathan the following morning for a more thorough behavioural analysis by the CRRU's whale biologists. Assisted by the Forth Port Authority, the International Rescue Corps, medics from the CRRU, BDMLR & SSPCA, and the "Silver Darling", a flotilla of 4 vessels set off on Sunday morning to search the wide expanse of the outer Forth waters to find the whale once again. In spite of a 2.5 hour search of the area, however, there was no sign of the humpback and no further reports from shipping in the area. Perhaps it had already moved on? No sooner had we arrived back at Port Edgar though, when we received a radio call from a yacht named "Raving Mad", telling us that they had a large mammal on the port side of their boat at that very moment. Not wishing to miss this opportunity, we asked the vessel to stay in visual range of the whale and set off to liaise with the crew in a small inflatable boat. Fifteen minutes later and we had "Raving Mad" in our sights. And "there!" was the whale to the aft of the yacht - it's huge flukes raised high into the air as it commenced a deep dive. We immediately set to work, taking GPS positions, bearings, depth readings and setting the stop clock to commence our behavioural sampling. With engines shut down, we listened in silence for the blow of the whale as it resurfaced again. 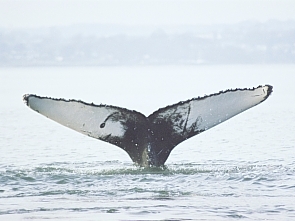 In the UK, humpback whales are most commonly found along the continental shelf and Atlantic frontier - from the Shetlands, along the north West Coast of Ireland and down to the St. George's Channel between Southern Ireland and the Welsh mainland - and encounters on the east coast of Scotland are certainly few and far between. Whilst there have been reports of this species in the Firth of Forth in previous years, no identification photographs of the tail flukes of these individual visitors were ever obtained. Our identification records of this animal would therefore provide a unique record of its presence in this area for future reference. They would also facilitate our collaboration with humpback whale researchers from the North Atlantic to establish for a start from which population this individual may have come. "BLOW!!!! ", we all shouted in unison. That was much closer. We were keen to determine that this whale was behaving normally and, by recording the animals dive sequence and surfacing intervals, we could compare the collected data with information collated for a healthy humpback whale that the CRRU researchers had been fortunate enough to have recorded in the Moray Firth the previous year. Over the following forty-five minute period, cameras whirred and chinagraph pens scribbled as we recorded the encounter with delight! We estimated the length of the humpback at approximately 13 metres - a fully grown adult no less - and photographs taken of the whale's tail flukes were found to be very distinctive indeed. Most pleasingly, the behaviour of the whale, or "Beamer" as Gareth had affectionately nicknamed it (after Beamer Rock in the Forth, where the animal was first seen), appeared to be quite normal. Happy in this knowledge, and with confirmations of good body condition from several pass-by inspections, the decision was made by Dr. Robinson and the team that Beamer should be left in peace and, overwhelmed by our experiences with this graceful marine Goliath, we all made our way back to the Port. So why would a humpback whale chose to visit such a strange location? Well, unlike the deeper water sperm whale (we all recall the saga of Moby back in 1997), humpback whales are in fact renowned for spending much of their time in shallower coastal waters. Beamer may have come into the Forth because of a prevalence of food, or it could be using the estuarine waters to rid itself of freshwater-intolerant parasites. The Forth estuary reaches depths of up to 80 metres in the central channel, thereby providing favourable upwellings. Beamer was also seen lunge feeding in the central channel (photo, left) so there must be an appreciable supply of food in this area which the mysticete whale is obviously keen to exploit. With identification records of this individual now in hand, in years to come we may be able to establish whether Beamer is in fact a regular visitor to these Scottish waters. Additional sightings of 2 other humpback whales off of Girdleness near Aberdeen on Thursday 13th February seems to suggest that we currently have quite a gathering of these animals along the east coast at this time, which is very exciting indeed. "For the meantime we are not overly worried that Beamer is in any immediate difficulty. Our observations indicate that the whale appears to be in good condition and is behaving perfectly normal for a humpback. That saying, like ourselves, whales and dolphins can become sick or diseased and there is always the possibility that this animal could become stranded. A review of the stranding archives for Scotland dating back to 1967, however, has revealed no records of humpback whale strandings ever occurring in this area of the North Sea; which is rather encouraging at this time. A comparison of the photographs we took of Beamer with pictures of other humpbacks encountered in UK waters has revealed no match at present. Digital images of the tail flukes and dorsal fin have been sent to the Marine Mammal Laboratory at the College of the Atlantic in Maine, USA, to identify this whale from the thousands of animals on file in the North Atlantic Humpback Whale Catalogue. As you can imagine, the US researchers have been very excited to hear from us, and they hope to complete their analysis as quickly as possible and let us know what they are able to tell us about Beamer. At this time, boat owners in the area are being discouraged from seeking out this animal. Estimated at 25 to 30 tonnes in weight, the whale may be unpredictable if confused by too many vessels trying to get close to it, and this could result in disaster for either the whale or a well-meaning boat crew. If anybody happens to come across the animal incidentally, they should make their course as predictable as possible for the whale by maintaining a steady forward course without sudden changes in direction or engine speed. Sailing boats are advised to switch to sails, and other boats may wish to shut down their engines until the whale has passed on its way. Shore watching may prove to much more rewarding at this stage, and we are always keen to receive sightings information from the public - you never know, there may be more than one humpback whale in the Forth afterall..?" Footnote (1st March, 2003): "Beamer" the 13 metre Forth humpback whale has now been largely resident in this area for almost 3 weeks now. Researchers at the CRRU have been working closely with colleagues at the College of the Atlantic, but have been unable to establish a match with any of the humpbacks from the North Atlantic Humpback Whale Catalogue (NAHWC) (representing 5,380 individual animals from known breeding/calving grounds in the West Indies & Cape Verde Islands, and all feeding grounds from the Gulf of Maine and Scotian Shelf, Gulf of St. Lawrence, Newfoundland, Greenland, Iceland, Norway and other areas in the Eastern North Atlantic (including animals from Ireland, Scotland, the Azores, Spain, and the Mediterranean)) or from the former (1992-1993) YoNAH Catalogue (or what's left of it, as this is slowly being intermatched with the NAHWC), and have therefore been unable to determine from which population this individual belongs. Beamer has subsequently been issued a brand new HWC# of its own. On behalf of the CRRU & British Divers Marine Life Rescue, many many thanks to all who assisted with the operation at the weekend: especially Chris Still and Anna from the Port Edgar Sailing Club, for the provision of the RIBS and expert knowledge of the Forth waters; the Forth Coastguard; MOD Police; Forth Navigation; CRRU, SSPCA and BDMLR Medics (in particular Elaine, Nick, Kate, Gareth, Fergus, Penny & David F-S); the International Rescue Corps team; and last, but by no means least, Richard MacKenzie and his crew aboard the "Silver Darling" and the crew of "Stark Raving". Additional thanks to the Centre of Coastal Studies, College of the Atlantic, Maine US, Scottish Agricultural College and colleagues at the University of Aberdeen & Napier University. To learn more about the humpback whale, visit our "fact files" section HERE.